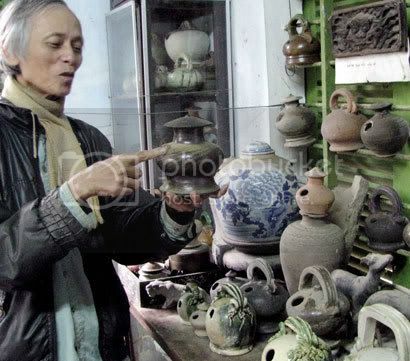 Phu Hiep Ward, a retired teacher in the city of Hue, spends his time collecting ancient ceramic jars dredged up by fisherman. Phan divides his collection into three groups according to their period. The first group is prehistoric antiques which he considers most valuable. His collection contains thousands of items including objects which prehistoric people used daily such as vases, jugs, pots and pans. The second group comes from the second to 14th centuries. The third group, mainly copper items such as lime pots and flower pots, originated from the 14th century to the Nguyen Dynasty (1802-1945). Among the prehistoric artefacts – which I think are the most significant – are the ones described as the Sa Huynh culture, an IronAge culture that is widely thought to be the precursors of the Cham.